To Book Andy Mac Door for one of your events, you are asked to take note of the technical conditions on this page. As Andy Mac Door is a DJ Producer artist very different from the others, by its size and way of mixing, you must know the physical and creative constraints of this personage, for adequate your assess space and be able to receive him. Andy Mac Door is an imposing personage measuring 2,20m for 130kg. 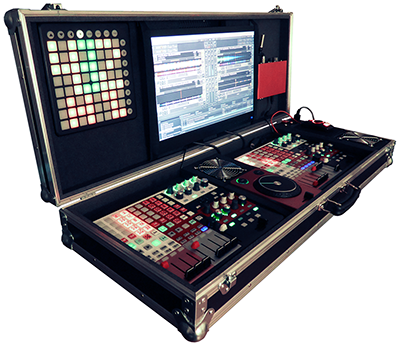 Also, Andy Mac Door is a DJ who has developed his own 4-decks mixing equipment, to enable him , among other things , mixing any music on one LA granted to 432Hz in place of 440Hz normalized , this in the cares to give his music the most similar frequency possible to nature. 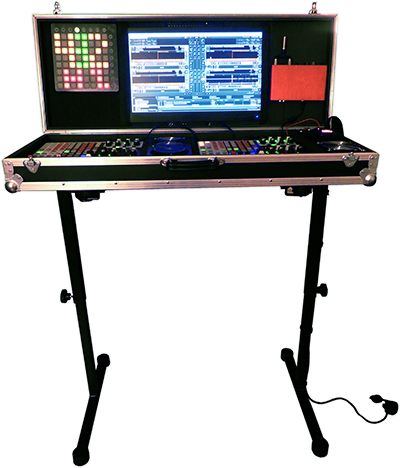 On either the very large size of Andy Mac Door (2m20), his dj equipment can not be placed on a stand, (table, desk) having a smaller size of 1m10 height and 1m10 of width. However, as it is often difficult for the organizers to provide a table at the right height for put the mixing equipment, Andy Mac Door can move with his own mix stand. Thus, for a stage performance, a zone with a width, a height and a minimum depth of 2m50 is essential for the success of it. The Andy’s armor, is an imposing costume full of technology; Micro, Walkie Talkie, Ventilator, Helmet, Amplifier, Synthesizer, Effects processor, DMX controller, output LED light on and show to the whole costume, all battery powered or mains with automatic load relay. Also to make the most of the stage performance, it is essential that it be accompanied by smoke or fog machine towards Andy Mac Door, to bring out the lights. 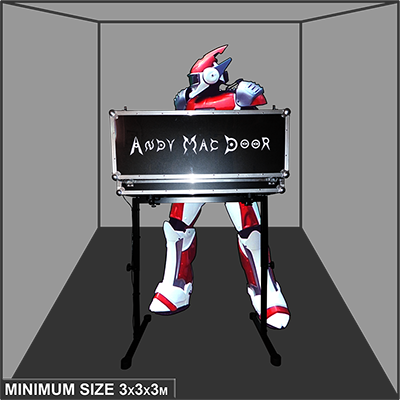 If you have smoke or fog machines, you must guide it to the stage, otherwise, Andy Mac Door may come with its own 700Watts smoke machine that activates itself by its Dj booth. The transport of Andy and his material is made by van with driver. For each event, Andy is accompanied by a technical assistant, a security guard and a videographer photographer. At least one hour before the scheduled start of mix, Andy and his team are on hand to install the Dj equipment and Andy's armor. It takes about fifteen minutes to install the DJ hardware and a maximum of thirty minutes to done the armor. Currently Andy Mac Door's armor weighs 40 kilos. Andy can offer a musical performance of 2 hours maximum. As soon as the stage performance is over, the team of Andy rids the Dj booth scene in 5 minutes and takes it in a secure backstage room in maximum 15 minutes. Once done, Andy and his team will go to backstage for evacuate the place, and for take the material equipment with discretion. If you can fulfill all its conditions and if you are interested to have Andy Mac Door in one of your events, please contact us by mail, by first exposing the locations, dates and desired delivery schedules, please give us your phone number and a short description of your event.